Please spread the word! Frank was LOST on January 10, 2019 in Los Angeles, CA 90024 Near Crestview Ct & Wilkins Ave Message from Owner: Please help us look for Frank. He is almost 9 years old and alone and cold. 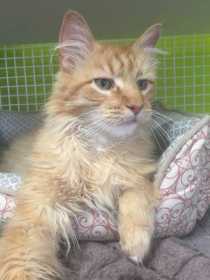 If you see him please call 626-221-5917 or email info@karmarescue.org Description: Orange tabby. Long Hair. Green eyes.